Well made from robust, colourful, phthalate free, fire retardant anti-bacterial fabrics and filled with a fire retardant CFC free foam specially selected for firmness. An infinity of reflections captured in soft play. 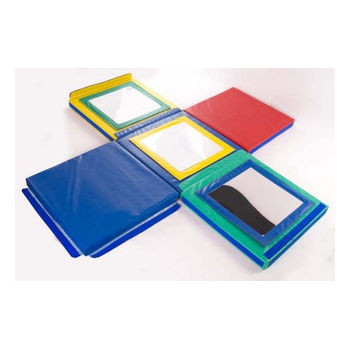 Five large, colourful, foam filled panels with 3 removable coloured framed mirrors, and two plain, join to make a house of mirrors, a triangular tepee, and large floor mat. Mirrors remove to extend the life of the product and to enable you to and add your own sensory materials or replace worn out parts. To EN71. Cigarette and match to BS7176 Contract Furnishing (Low Risk). Remove shoes before play. Plastic safety mirrors: clean only with household furniture polish or damp/dry cloth. never with abrasive or amonia based window cleaners which will seriously damage the mirror. Size: 5 x 800mm square x 80mm thick panels: 3 with mirrors. CAUTION: DIRECT SUNLIGHT REFLECTED IN MIRRORS CAN CAUSE HEAT DAMAGE, AND CAN DAMAGE EYES AND SKIN. DO NOT CRUSH OR BEND MIRRORS IN PLAY. REPETITIVE CRUSHING AND BENDING WILL DAMAGE MIRRORS.